Each month, Big Brothers Big Sisters of Northeastern Wisconsin shines a light on the relationships that we are helping build within our community. 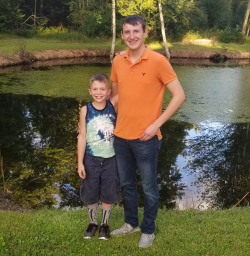 Please help us congratulate Big Brother Dylan (18) and Little Brother Isaac (9) of Shawano – our October 2018 Match of the Month. 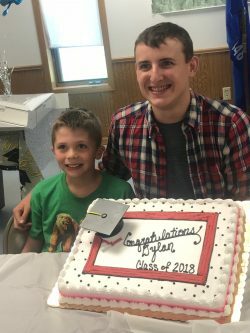 Dylan Mastrodonato: Chris Marcks made a presentation at Shawano High School and I decided to get more information after hearing about the program. Dylan: Because I thought it was an amazing way to spend my free time and put it toward an amazing cause while still having a lot of fun. Isaac: To have a positive male figure with similar interests that I can relate to and can confide in. Dylan: Hang out at Kid’s Klub, play sports, board games, help with homework, talk. Dylan: One day, when we were playing sports at Kids Klub, we were having a blast and I was getting ready to leave. Before I left, Isaac turned to me and said “I can’t wait to see you next week!” The feeling was unexplainable. I will never forget that day! Isaac: My favorite memory with my Big was watching him walk across the stage at graduation and laughed as I saw him practicing his calming breaths and being able to celebrate that accomplishment with him. Dylan: We are switching to community based, so we are looking forward to doing activities outside of the site-based program … especially fishing! Is there something you would like to do together in the future and why? Isaac: I enjoy when it’s fishing days at Kids Klub and Dylan is able to join us at Monkey Island. We get to hang out with each other and catch fish. I also look forward to my weekly visits with Dylan, he has been a great addition to my life and I hope to have a life-long friendship. Dylan: Isaac truly cherishes our time together as much as I do. Seeing the changes in both of us throughout this adventure together has been the part I have enjoyed the most. Isaac: Something I have learned from Dylan is to always enjoy your time, no matter the place or time. Dylan: I have realized how much I have connected and come to understand kids throughout this experience. We also look forward to our little bracket of time together. What would you say to others about Big Brothers Big Sisters and to others who are thinking of becoming a Big? Dylan: The children in the program truly cherish your time together with them. It only takes a short amount of time to make their day great.